Google has started a revolution in bringing people from the Internet back into the real world with location specific updates made by strangers in the form of Google Buzz. 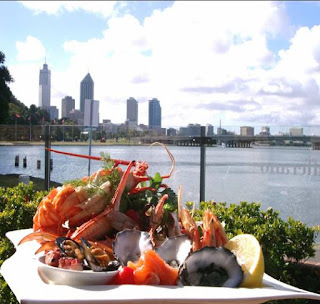 Perth has only started to buzz and we've taken on ourselves to welcome Perth people to the world of Google Buzz as there are only about 20 or so regular buzzers out there.. get your phone and join in and keep an eye on this blog as we bring you the best tips for Perth coming from buzz! You cannot see buzzes on Google Maps unless you use your mobile phone or follow this link (if you are in Perth) https://m.google.com/app/buzz?force=1#~buzz:view=nearby. and reviews such as the one Mark Palandri posted about Zafferano's Seafood restaurant. When Mark asked how the food is there, we asked him to buzz his experience after the meal. With his permission, here's his review of Zafferano's - the longest buzz update posted in Perth so far! Last night, my wife and I joined several members of our extended family for dinner at Zafferano to celebrate my mother's birthday. Zafferano can be found at the old Swan Brewery on the edge of the Swan River right below Kings Park. The location for the meal was a suggestion from my uncle who described it as "pricey, but with a great view". In retrospect, I'm not sure I can improve much on this summary except perhaps to add, "and excellent food". We had reservations, and though we arrived early, the table was ready for us and we were seated immediately. The staff were generally attentive and, if not quite rising to the level of friendly, at least managed to react professionally and efficiently to the demands of our largish group. The interior was uncrowded and comfortable; everyone had plenty of space to enjoy their meals in a light and open atmosphere. The decorator clearly recognized that the views of the river were the best part of the decor, and didn't try to compete with them too much. Good ambiance and great views are one thing, but what about the food? In a nutshell: the food was easily a match for the surroundings. As the name suggests, Zafferano serves Italian style dishes, with the majority being seafood in a multitude of forms. Not to worry though, there are also plenty of meaty and vegetable dishes to choose from if fish isn’t your cup of tea. After a round of Kyr Royales to whet the appetite while perusing the menu, dinner orders were taken and bread baskets appeared. I've found that the quality of a meal is closely correlated to the quality of the bread that is served before it. My fears were put to rest by the warm and tasty ciabatta accompanied by an even tastier sun-dried tomato tapenade. I'm glad I grabbed a piece when I had the chance because there wasn't any left when I went back for a second. Another reason I was glad for that piece of bread is that it was the better part of an hour before our first courses appeared from the kitchen. I love gnocchi and the gnocchi gorgonzola entrée I ordered was everything I had hoped for. So often when I order gnocchi I am served a plate of hard rubber lumps, but not this time. They were perfectly cooked soft doughy pillows from heaven in a deliciously pungent gorgonzola cream sauce. The only odd thing about the dish was the inclusion of a dollop of stewed eggplant chunks in the centre. The eggplant would have been OK on its own, but was an unnecessary and distracting addition to my gnocchi. My wife ordered the beef carpaccio and it too was excellent; the tender meat just melted in my mouth. Once again though, the dish had some unnecessary additions in the form of mayonnaise stripes and thinly sliced cucumbers. It's almost as if the chef didn't trust the dishes to stand on their own without these superfluous extras. My mother and aunt ordered the raw oysters and effusively complimented their freshness and taste. For the main dish, I ordered the crispy skinned barramundi special. The fish arrived balanced on a lump of mashed potatoes surrounded by a two small piles of cubed steamed vegetables and a light butter sauce. The fish was really good; the skin was super crispy and its texture and taste were a perfect counter to the more subtle and flaky flesh beneath. The accompanying mashed potatoes were only so-so though and I didn't bother finishing them; I think a light risotto would have worked better instead. A little more of the delicious butter sauce would have been nice too. My wife ordered the Frittura Mista and seemed quite happy with her choice. In fact, I didn’t hear a bad word about any of the food from anyone at the table. The portions were good sized and by this time we were all starting to creak a little at the seams. But, we still managed to find a little room for dessert. I ordered the Graffe di Mela which turned out to be three sugar-coated doughnut balls filled with custard served with some warm stewed apple chunks and vanilla ice-cream. The presentation was so nice that I felt a little guilty when I took my fork to it. All guilt vanished though when the first bite hit my taste buds; it was a great finish to a great meal. My wife ordered the Frangelico gelato affogato, which a stolen bite confirmed to be similarly delicious. All in all, it was a wonderful evening spent with close family and excellent food in an unforgettable environment. It was particularly unforgettable for my father who ended up footing the bill. One thing you cannot say about Zafferano is that it is cheap; expect to cough up at least $100-$150 per person, even more if your taste in wine is particularly refined. Stay up to date with what's happening in Perth with Google Buzz and say hi to us next time you see us on buzz!